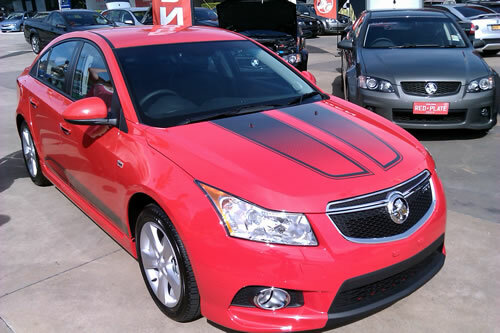 The Holden Cruze is a nice car and cruises effortless on the highway and day to day driving. The biggest problem however, is the HUGE FLAT SPOT when you accelerate from a standing start. This mainly happens when turning right, across other lanes of traffic, and especially when it is busy and you are trying to get through a small break in traffic. This flat spot is dangerous, as in that split second when the power dies, the oncoming traffic travels a significant distance. 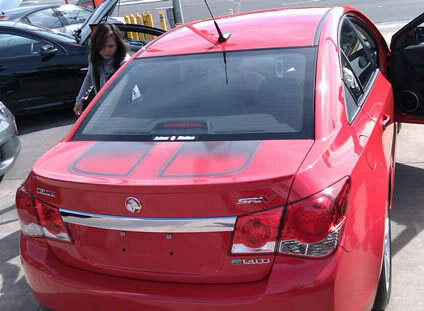 We have done lots of experimenting with exhaust systems on both the 6 speed auto, and the manual. We developed a dump pipe off the turbo, ballistic racing cat, stainless exhaust system, and now a custom tune. I don’t have any baseline dyno sheets at present, but the dyno sheet attached is after the exhaust had been done. After we upgraded the exhaust, the flat spot was negligible, and power had significantly increased, so much so that on the auto it spun the tyres changing from 1st to 2nd gear with traction control on, and it had never done this previously. The base line on dyno sheet is after the exhaust was done, and after already significant improvements were made to the standard power. 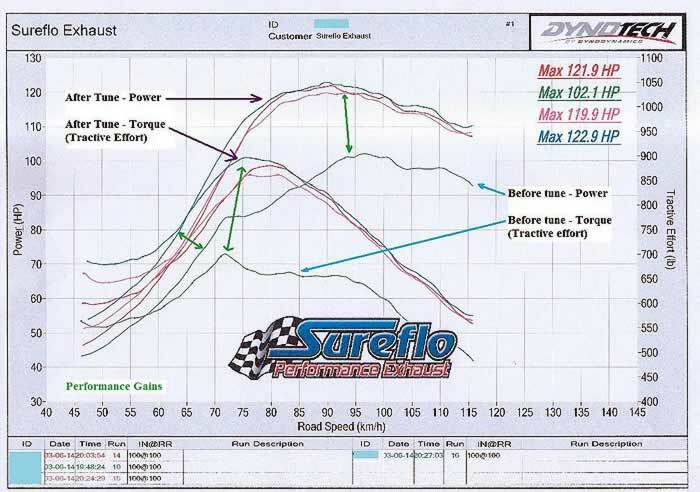 The dyno sheet shows the development of the tune on the auto. The power has jumped from 102.1hp to 122.9hp. Tractive effort is the torque or pulling power when measured at the wheels, and it jumped from around 680lb to around 880lb. The amount of peak tractive effort is also over a longer duration, which means a much wider power band, and it comes on much earlier. I have placed green arrows to make it easier to see the differences in power and tractive effort. If you drive for fuel economy, having much better power and response means that to travel at any given speed, the accelerator has to be pressed less, so you use less fuel. With the flat spot, particularly in built up areas, the accelerator is being nailed more often to get the car moving and out of danger. With more power, and no flat spot, smoother acceleration is possible. This is also a very safe tune, and it is not an aggressive tune, therefore the car drives normally without damaging the engine or gearbox/transmission, without harsh gear changes and without torque steer. Usually this car has 98 octane fuel, but on this occasion it only had 95 octane fuel, so better results can be achieved. 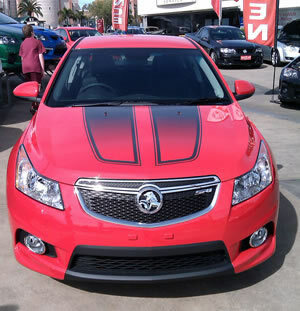 V Band fitting specifically machined to the same spec as the genuine Holden item. 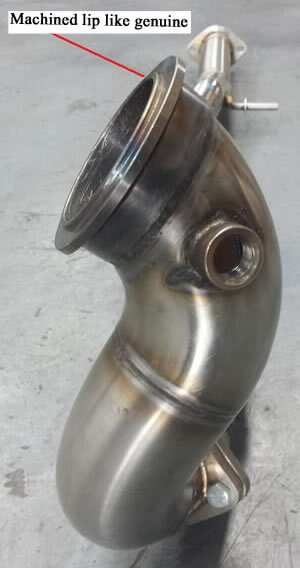 2.5" mandrel bent stainless steel pipe work which bolts to the dump pipe and to the flange in front of the stock resonator, making it a "Bolt On" performance modification.